[LAPSE... brain dead]: Random At Last! To those of you disappointed in the quality, content, length, and (in-)frequency of my recent blog posts, I hope to appease you with this one. Well, it'll be hard to satisfy that "freqyency" thing in a single post, of course, but I'll try to do better. First, how about a picture or two (or three)? 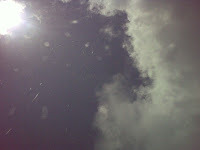 This one (<---left), which you probably can't make out very well, was taken from the sunroof of my car on Monday; it was POURING rain (the "blurred spots" in the picture), and yet the sun (that bright spot in the upper left corner) was shining brightly, to the point that it was heating my arm in the window. I've seen sun and rain simultaneously, b ut NOT like this! It was weird. 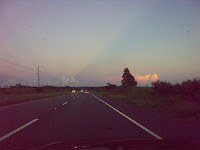 This one (right--->) was taken on the way home from work on Tuesday; it was just a strange looking sky. Click the image to see it enlarged, and you'll see what looks like "streaming sun from the horizon" coming from just left of center... it appears that the point of origin is over the horizon, but the sun is actually behind me - I'm heading east in the evening. Not really sure what caused that odd light display. 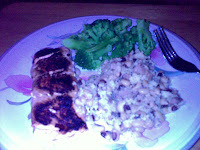 Finally, this (right--->) was my dinner last night (picture taken up close w/ my Nokia E71 phone's camera and its built-in flash, causing the oversaturation and the odd coloring): my wife's AWESOME salmon (of which I have NEVER tasted its equal, ever, anywhere; not even at O'Charley's or anything! ), some broccoli, and black-eyed peas mixed with couscous. "Couscous" - sounds funny, actually tastes pretty good, which is good if you're doing the South Beach Diet (like I am) since you're not supposed to eat white rice. Couscous is kind of like "midget rice" - but with a slightly different texture. I like it. I think I'd have preferred the peas separately, but it was good in the couscous, too. So... I think I've determined my ideal job: Emperor of Japan. No power, no real responsibilities, just lots of free time and really good, healthy food. The week I spent in Japan (2007, I think) I had MUCH fewer issues with my acid reflux (as compared to my usual acid reflux issues eating unhealthily American). I know, "King of England" would suit nearly as well, and not have as much of an earthquake problem, and while the Irish food is pretty good, too, I really prefer Japanese cuisine. I wonder where I need to apply for "Emperor of Japan"? Speaking of dreams... I had a really weird one last night. In the dream there was something wrong with me, cancer or something (don't know what; I think I knew in the dream, but apparently my subconscious thought that wasn't a part I needed to know for the story), and after eating I had something stuck in my teeth (that's a common problem I have; in fact, I keep a package of floss in my car for just such issues after lunch at work). Anyway, we were at someone else's house, and so I went into the bathroom to see if I could find some floss, and all I could find were some floss-picks. So I grabbed one and went to town on the white "stuff" between two of my upper-right molars... and eventually managed to work this "thing" loose, and pulled it out... and it was a tooth! Somehow, there was a one-inch-long, one-centimeter-square molar "stuck" in my teeth, like it was a "rogue molar" that had somehow formed there. Anyway, I pulled this thing out (don't ask me how - it doesn't even make sense that it could BE there, or that it, given its size, could be "stuck" between my teeth in the first place! ), and it was all bloody, but it was dried blood, and there wasn't a lot of blood nor a huge, noticeable hole in my gum. I swished some water around, expecting some stinging pain from an open wound, but no pain, and I couldn't even really feel any hole in my gum with my tongue or anything, just relief from the "stuff stuck in my teeth." My wife said, "Come on, we need to get you to the hospital," but I was arguing that it didn't hurt and wasn't bleeding so obviously I was fine. Weird, huh? I think I've had someone comment on a dream on here before, so come on, you dream interpreters, give me an explanation on this one! And, once you're done with those, please consider visiting The Give Worship Project - a project founded by a semi-acquaintance of mine, whose goal is to "to help equip and encourage [indigenous worship leaders throughout the world]" by providing both instruction, encouragement, and equipment "as they help to 'make His praise glorious...'"